Occasions is a full service Prom, Pageant, and Formal-Wear salon. We specialize in helping you find the perfect gown with all the trimmings. Our gowns are presented in a relaxed and warm atmosphere that is truly helpful to better serve you. We encourage you to browse our selection of various designers. 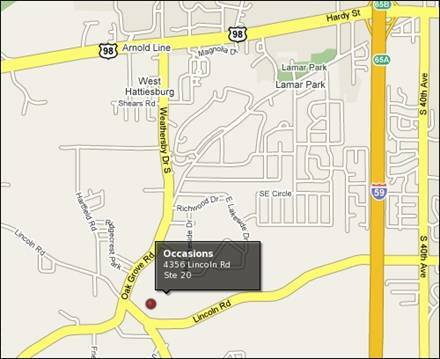 We are located near the intersection of Lincoln and Oak Grove Road. This service is provided by experienced and professionally trained seamstresses. All alterations are a separate charge and costs will vary. Alteration charges must be paid with cash or check. All alterations are set up by appointment only and will only be offered to customers that have purchased a dress from Occasions.